Our online (and our real-life) handmade candle stores in Ontario, Canada welcome you with an array of delightful handcrafted country candles. 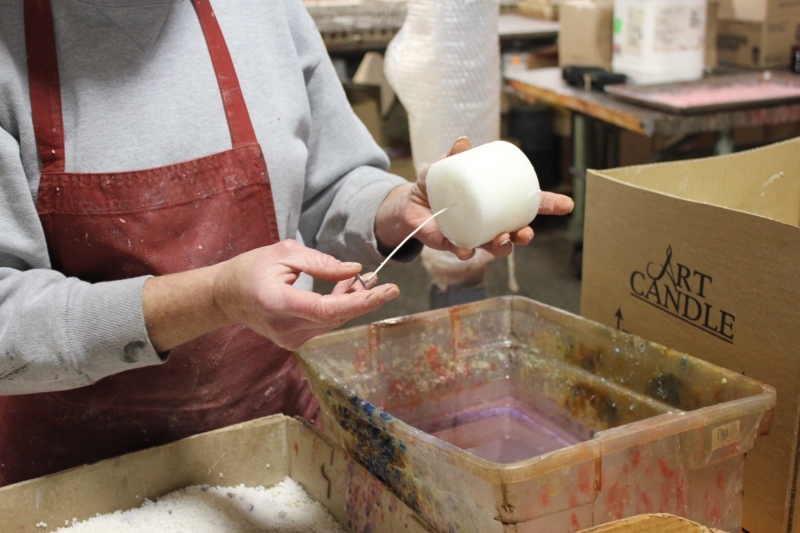 While they’re not made at the kitchen table, as they were in days of yore, they truly are crafted by hand in our Meaford candle factory. At Country Affair Candles, our specialty is the rustic pillar candle. 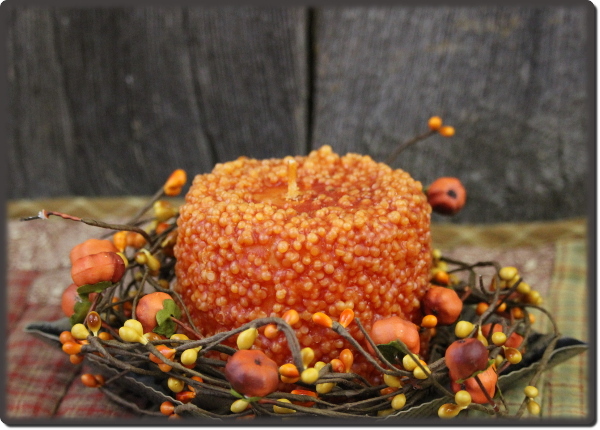 Coated with a special frosting of wax crystals, these country candles are reminiscent of the ones made by American and Canadian pioneers. In our Meaford factory, we’ve discovered how to recreate this style, with a slightly more refined look than the most primitive cake candles, to suit your modern country home. 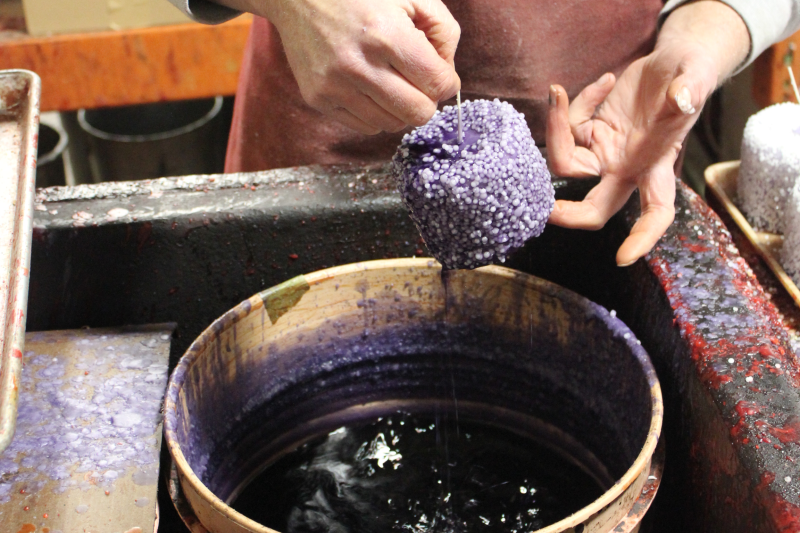 Our candle makers draw warm, liquid wax from our large tank into a vat. While the vat is kept warm on burners, the candle maker blends in the colour (if required) and the aromatics. This is the secret that keeps the delightful scent in a Country Affair Candle throughout its life. Most of the candles you’ll find from large manufacturers have a little scent on top, which is gone after the first couple of burnings. Ours is blended throughout. It costs us more, but the difference is worth it. 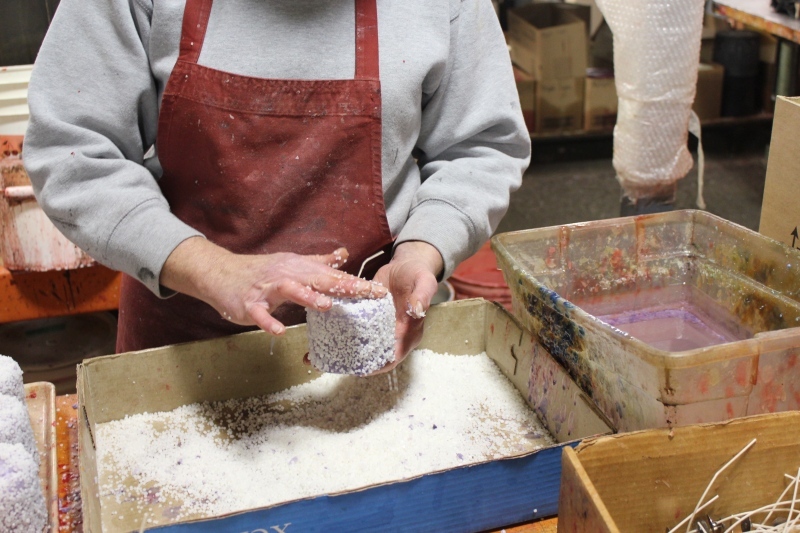 The candle maker draws the mixed wax from the vat into buckets and pours it into molds. In addition to different sizes of pillar candles, including the “Ice” Pillar we’re making in the photos below, we handcraft other shapes, including loafs, votives and tealights. We also manufacture candles in various unique jars. As the wax cools and hardens, it shrinks, and we need to top the mold with really hot wax so it bonds and creates a level surface. 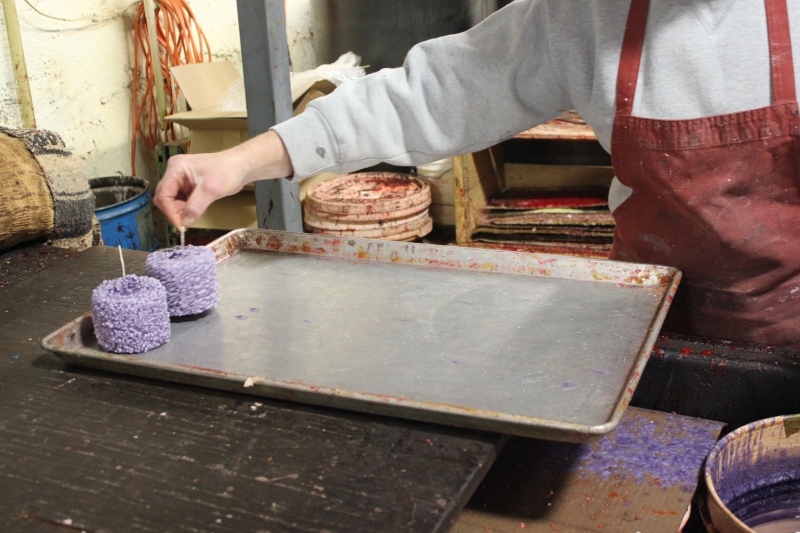 When the candles are topped and hardened, they’re ready for the final steps. The candle maker removes the pillar candle from its mold, drills holes in the center of each candle for the wick, and inserts the wick through the candle. Now it’s time to apply our signature country candle texture. Our candle maker holds the candle by the wick and dips it in a vat of a warm wax, which is blended with colour and, yes, more fragrance. Then into a liquid agent that makes the wax tacky as it evaporates. Now, she applies small wax crystals or balls to the gummy exterior of the pillar by hand. And finally she dips the candle back into the coloured, scented wax. The wax coats the crystals and firmly bonds them to the candle. As you can see, from start to finish, a Country Affair candle is a truly handcrafted candle. Enjoy them for yourself.